After so much lamb from Easter i wanted to eat something softer and decided to cook some turkey with garlic and chilly stuffed into the meat and roasted in olive oil for dinner. As a matter of fact first was the wine selection and then the food, but don’t tell anyone. The wine is something special. First of all very brief about Marques de Murrieta. Marques de Murrieta is unquestionably one of the leading bodegas in Rioja. Castillo Ygay Gran Reserva Especial is a traditional Tempranillo dominated blend, which following on from six months in vat will often see in excess of 36 months in American oak before bottling. There is also a Reserva Especial, a similar blend also subject to prolonged wood ageing; both wines are only made in the best vintages, otherwise Marqués de Murrieta will produce a range of standard Gran Reservas and Reservas. Castillo Ygay has the same label for over 100 years. Just to get even a better idea about the quality and potential of such a cuvee, in 1986 the Bodega started to bottle the 1942 vintage, that was kept in barrels for 44 years. It seems that the barrels had so much tar crystals on the inside that the wine was practically kept in a glass like container. Starting with the 90′ due to financing issues they shortened the barrel aging. 2001 was an exceptional vintage in Rioja that produced extremely complex wines with huge aging potential. 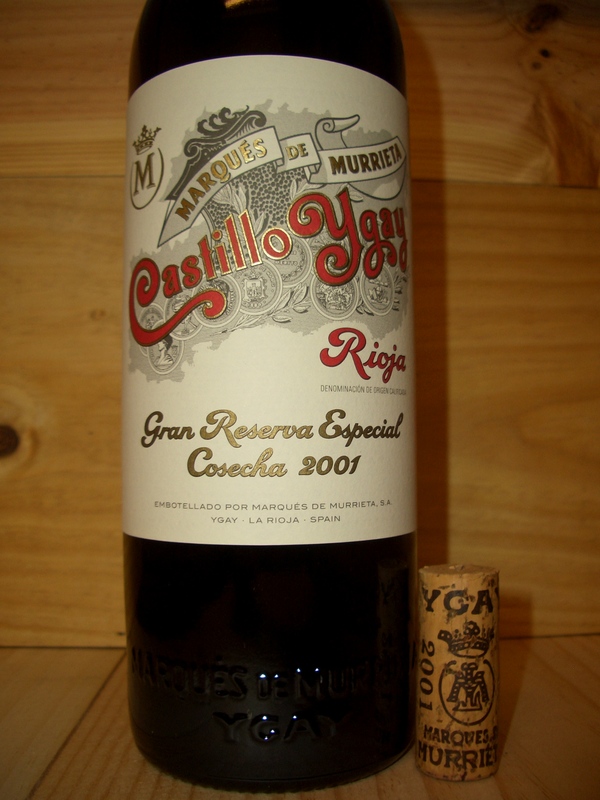 The 2001 Marques de Murrieta Rioja Castillo Ygay Gran Reserva Especial was kept in American oak barrels for 36 months. This wine has an aging potential of 50+years. This was one of the top 10 wines included in the Top 100 wines of 2009 of Wine and Spirits magazine. Color: red with purple color with some brick color at the rim. Nose: very complex, red and dark fruits, cigar box, vanilla, spices, mint, some meaty tones as well. Taste: this is real finesse, pure silk; intense flavors of red fruits and American oak(not over-oaked, just perfectly balanced), fine tannins, chocolate, red peppercorn,dry plums, medium acidity. Palate very Bordeaux with great complexity. The aftertaste is holding over and over finishing with spicy flavors. This wine is exceptional. If you ever get the chance to find this wine BUY IT. I paid 34 EUR for this bottle. I bought this wine in one of my trips in Barcelona, but the good news is that there is a store in Sibiu and they do have the wine. This wine gave far more flavor and was more satisfying than the Pichon Longueville Comtesse de Lalande 2001 that i had for Easter for drastically less money. Just bought two half cases from Costco in Scotland for a total of £324.Really bought the wine without knowing much about it.Came home to find your feed and a feed from the wine library and you both rave about it. Only bought it because i won £325 at the bookmakers a short time earlier.Now looking forward to drinking it.It must have been fate that i won the same amount as the wine cost. Well congratulations Malcolm for your purchase. I believe you’ll like the wine. Please try the wine and come back here with your tasting notes and overall appreciation of the wine. My last experience with this wine was about 1 year ago so the wine should probably be even better today. I look forward to hear your comments again. Hi, and thanks for the article. I’ve collected some of these wines since I was 17 years old. Ive got a bottle from 1956, 1962, 1968, 1972 and 1978. Do you have any idea what they are worth today? I envy you for your collection of Ygay. Unfortunately I am unable to tell you any impressions on the wines you have. I only tasted the ones I wrote about. But when you decide to drink them I would be grateful if you could share your impressions on the wines here.